Growlers of the Gridiron is a football themed game played on a field that is 30 yards x 20 yards, with two 5 yard length x 20 yard width endzones. Therefore, there is a 20 yard length x 20 yard width field of play in between. 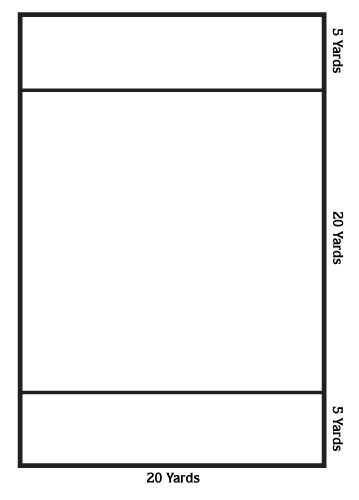 The handler must start in either endzone, and throw in the direction of opposite endzone. Every catch in the field of play is worth 1 point. Dogs must have all 4 paws in bounds or it counts as a drop. No points for out of bounds. Touchdowns will be awarded anytime the disc breaks the plane of the Goal Line. 4 drops end your round. Catches in the endzone are worth 3 points, plus 1 point for the catch, for a total of 4. Catches must be a minimum of 5 yards forward or it will count as a drop. The only exception is a throw into the end zone, which can be any distance. After scoring a touchdown (making a catch in the end zone), you must reverse direction. After a drop, you return to previous throw spot. Up to 5 discs may be used, and the dog does not have to bring the disc back.